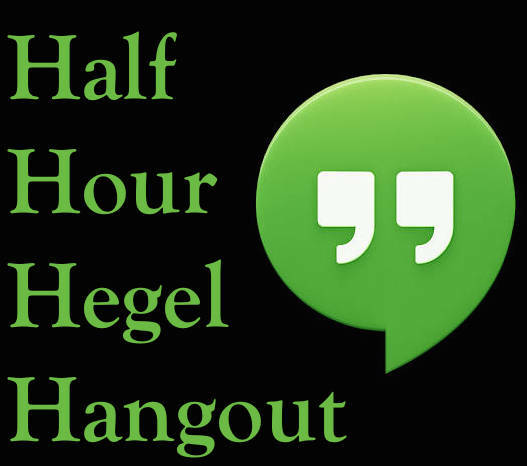 Tomorrow evening - from 5 PM to 6 PM Central Standard Time - I'm holding the Public Half Hour Hegel Q&A Hangout for the month of February. I'll be posting the link to the hangout - once its opened - on my Facebook author page, on my Google+ page, and on my Twitter, so if you want to get in, you'll want to watch for it at one of those virtual locations. You'll also need to have the Hangouts software on your computer or app on your phone. Anyone is welcome to pop in, and I'll be giving priority to those who have actual questions for me. Google at present only allows 10 people at a time to be fully present in the Hangout (i.e. through their own video), but anyone can watch and use the text box to ask questions or make comments. So, if you've got a yen to talk some Hegel, mark it on your calendar, and watch for that Hangout link!